WOW! 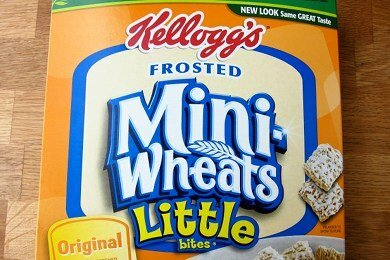 You can improve your attentiveness 20% by eating "Frosted Mini-Wheats" - a clinical study says so! So, Snack Girl, doggedly pursued this study so she could share this ground breaking research. Alas, it isn't published in a scientific journal so I couldn't find it. What I did find was a study on the Kellogg's website that was paid for by (guess who?) - Kellogg's! Of course, the research is "independent". Children were tested prior to eating breakfast to get a base measurement. Then, children were either provided a breakfast of Kellogg’s® Frosted Mini-Wheats® cereal or water. Then three hours later - the children who had eaten cereal did better on a test than the children who had just had some water for breakfast. Seriously, folks, this is what they are able to quote on their commercial. This research is just BLANKETY BLANK BLANK (insert expletive). Let's try Snack Girl's test! I think it will be much more useful. 1. Is the first ingredient whole grain? Yes! The first ingredient is whole grain wheat. 2. Is there 5 grams or less of sugar per serving? No! There is 12 grams of sugar per serving. 3. One serving must provides at least 4 grams of fiber. You can remember this one with Four Fiber. Yes! It has 6 grams of fiber! So, Frosted Mini-Wheats does okay. The problem is that it is super sweet - and I found it to be too sweet (approximately 3 teaspoons of sugar before you add the milk). One half cup of milk is going to add another 6 grams of sugar to this breakfast and so now you have over 4 teaspoons of sugar. What to do? How about mixing it with some wheat puffs or other zero sugar cereal? Another suggestion is to try Kashi's Autumn Wheat Kashi's Autumn Wheat which is ORGANIC, has seven grams of sugar, and would have cost me less than Kellogg's Frosted Mini-Wheats on the day I purchased them. Kashi's cereal was $3 for a box and Kellogg's was $3.80. Give it a try! Do you like Frosted Mini-Wheats? Gotta read the print on the commercial ... it compares it to kids who have no breakfast. That would make sense. The kids with no breakfast are very hungry and thinking about eating. Whether it's a kid or an adult, you must eat breakfast. as a sociology student (and consumer in general!) I am always skeptical of companies quoting "studies" to market their product. Of course most people will feel alert after a bowl of cereal in the morning than just water! Also, I'm sure that sugar contributes to their energy. Frosted mini wheats are definitely yummy but definitely not that healthy as a daily breakfast that should be nutrious and keep you full. Thank you for calling out their claims! Since I'm Diabetic and gluten intolent this product is a definate NO-NO! I'll just stick with my Iowa farm fresh eggs! It's better to start the day with protein and good fats! Wondering what SnackGirl's thoughts are on Fiber One's version of Frosted Mini Wheats? I eat this cereal a lot for breakfast and love it but haven't looked to deeply into the nutritional aspect. I love the Trader Joe's version of frosted mini wheats...maple & brown sugar flavor. But I normally eat it as a snack, not breakfast. I don't really buy cereal at all. Even if it has a couple of food points, it has a lot of chemical and a lot of sugar. If you look at a box of cereal, it has a ton of ingredients. I only buy organic cereal for my husband. It's slightly better, but it still usually has a lot of (organic) sugar. I eat yogurt for breakfast, although when I have time I love making a breakfast burrito - just an egg on a whole wheat tortilla. We eat the Kashi Autumn Wheat ones you mentioned all the time. I only get the original ones though, as the vanilla or cinnamon ones add extra sugar and calories. We usually just eat them without milk on the go. Really good. You can often find these at the Trader Joes near me as well. I try to eat whole foods and make most meals from scratch...however due to my zombie 'id' like state in the morning, I go for simple and sugary. I am IN LOVE with the chocoloate mini wheats. Those are so damn good. I just can't help myself. I figure, as long as I eat right the rest of the day...ok, most of the time, everything will balance out. I've never had a problem with weight or health so...bring on the sugary goodness! I feel sorta guilty as we literally eat Frosted Mini Wheats (thank you Costco) for breakfast AT LEAST three times per week. I guess I'm so used to it it doesn't taste that sweet to me...at least it's not Fruit Loops, right! Read the label! I quit buying this junk when I found out it had high-fructose corn syrup, gelatin, and BHT (found to cause tumors in rats). Good Work Snack Girl! I wouldn't worry about the milk sugar in plain milk; I would make sure the milk was low fat. Here is a site that you can go to to find products that have whole grains. 8grams is half a serving, 16 grams is a whole serving. 48 grams of whole grain is the minimum recommended by the dietary guidelines. Once you've found whole grain products then weed out those high in sugar and fat. Of course making your own is always better! need to mix the cereals to make them a bit more heathlier...i.e. fibre 1 (no sugar or salt, and bite size shredded wheat (no sugar or salt again), so add that to the mini wheats (just a bit of those) so still has the sweet factor for the kids, but good for you as well. At work, where we feed 18 kids every meal of every day, we modified your cereal test to include protein in addition to sugar and fiber. Frosted mini-wheats made the cut because they had a decent amount of protein to off-set the sugar. They are also filling - the kids would eat a whole bowl of Kix and want more but a half bowl of mini-wheats fills them up and they seem to be satisfied till lunch. I must confess to liking the chocolate mini wheats, not as a cereal but as a snack. I too mix sweeter cereals with puffed rice/wheat to "cut" the sweetness and the calories. I also do that and add either a little bit of trail mix, or individually add dried fruits, small quantity of chocolate chips and nuts to make a less calorie-dense "trail mix" that I carry in my purse for an emergency snack or for post-workout recovery. One of my favorite things to do with sweeter cereals, though (and I also love the maple shredded wheat cereal from Trader Joe) is to use it on greek plain nonfat yogurt... the sugar and protein offset and it makes a filling breakfast. If you drink water, of course you'd get hungry! It's 0 calories vs. the mini wheats + milk, which is about 240 calories or so with fiber and whole grain. If it was comparing it with another cereal, that may have made the study better, but other than that. A big no-no. lol I also found in the chocolate ones that there was artificial and natural flavoring. The sugar is super high. Or just eat regular shredded wheat. Made of ONLY wheat. 0 g of sugar/serving...I add a little stevia and cinnamon and then pour on almond milk....works for me when I need something quick! Yes, you are so right about added sugars in cereals. Even ones that don't taste that sweet can be loaded. I caution though against counting the sugar in plain white milk as a teaspoon of sugar though. These aren't added sugars, but rather milk sugar (lactose).